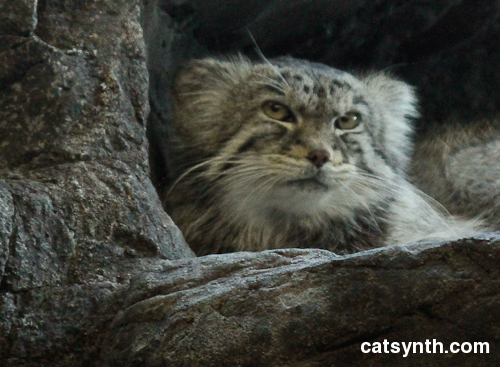 Every year on or around earth day (or “erf day”), we at CatSynth dedicate our Weekend Cat Blogging to some of the world’s endangered wild cat species. We look to the IUCN Red List of Threatened Species as our primary source for species that are “endangered” or “vulnerable”. There are several cat species on this list from many parts of the world, and we present a few of them here. This year, we focus on South America (for reasons beyond the scope of this article). The Andean region is home to some rather intriguing cats that we have discussed in the past. Perhaps the most intriguing and most endangered remains the gato andino, or Andean Mountain Cat. The Andean mountain cat lives in rocky areas at high elevations of the Andean region of Argentina, Bolivia, Chile and Perú. It is quite small, but has a very distinctive large tail. There is now an organization dedicated to studying and protecting the Andean cat, Alianza Gato Andino. There you can find more about the cat, see photos and also see more of the Andean landscape it inhabits. I am drawn to the starkly beautiful dry landscape, and perhaps will have a chance to visit someday. In reading about the Andean cat, I also learned about the Pampas Cat. The Pampas cat also lives in western South America, but is not considered nearly as threatened a species. As one can see from this photograph, it bears a resemblance to domestic cats, though with perhaps more squat body shape. The Guiña, or Kodkod, is a wildcat native to Chile (and parts of Argentina). It is also relatively small, with a thick fur coat and spotted markings. It is currently listed as vulnerable on the IUCN Red List, and until recently little was known about it. A project was undertaken in Chile to learn more about these cats. We round out our South American cats with the Oncilla. It looks quite like a domestic cat with wild the coat and markings of a wild cat. In addition to habitat pressures, it has been trapped in the past for the fur trade. We next go to southeast Asia where several of the worlds most endangered cats live. The very unusual looking Borneo Bay Cat lives only on the island of Borneo. It is quite rare, and little is known about this cat, but it was classified as “endangered” in 2005 primarily due to habitat loss. Perhaps the most endangered species of cat remains the Iberian Lynx. It is listed as “critically endangered”, with an IUCN survey suggesting between 84 and 143 adults left in two breeding populations in Spain. Conservation efforts are currently focused on supporting these breeding populations. 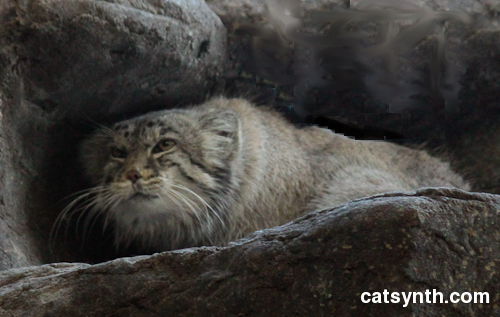 You can read more about the Iberian Lynx in our first “Earth Day Weekend Cat Blogging” article. Weekend Cat Blogging #254 is being hosted by Salome at Paulchens FoodBlog?! We at CatSynth continue our Earth Day (or “erf day”) tradition of reporting on endangered wildcats from around the world. We are always interested to learn about new cats, such as the Kodkod or huiña. Huiñas are relatively small (often 5lbs or less), and quite furry, and far found primarily in Chile and parts of western Argentina. It is also considered among the most endangered wild cats in South America, though very little is known about it. The Cat Specialist Group of the World Conservation Union conducted a study of the huiña in 2006. The huiña may be related to the more common Geoffroy’s Cat, which found in the hills and plains of Argentina. Although not officially endangered, it classified as near threatened. The CSG worked on a separate project to study the Geoffroy’s Cat in 2007. As such studies suggest, our knowledge of wildlife is always changing and growing. The Bornean Clouded Leopard has been known for a long time, but with few sightings and very little information. In 2006, it was officially recognized as a separate species, and immediately listed as a Vulnerable species. Sanderson is hoping that the new images will reveal some of the secretive habits that have kept the creature a mystery to scientists for nearly a century. “Pandas go for a million [U.S.] dollars a year to rent and are very well protected by Chinese law, but there is virtually no protection for this cat,” he told National Geographic News. We next visit the endangered cats here in the United States. The National Wildlife Federation maintains a report on Endangered Cats of North America, which lists several well-known species. The Florida Panther continues to be critically endangered. Current estimates suggest that there are fewer than 200 remaining, primarily in the Florida Panther National Wildlife Refuge and portions of the Everglades National Park. The main threats to the panther have been habit loss and scarcity of prey, though other issues such as inbreeding in such a small population can potentially be a large problem as well. Florida Governor Charlie Crist proclaimed March 21, 2009 as “Save the Floriday Panther Day”, and the species remains a major focus of conservation efforts. Increased efforts by the U.S. Border Patrol to stop illegal immigration into Texas from Mexico has degraded native habitat along the border. Some experts fear that the use of high-pow-ered “stadium” lights, brush clearing, fencing and road paving by Border Patrol operations in border areas has been detrimental to both the ocelot and its prey and threatens to inhibit ocelot and jaguarundi dispersalprotection. By the same token, additional research is needed on the historic and present-day distribution of small border cats and on the most pressing factors contributing to their decline. Reaching out to local communities through educational initiatives may be the most effective way to generate grassroots support and to bolster resources for ocelot and jaguarundi. We have previously discussed how border politics, including a proposed border fence, threatened these cats. On a positive note, the EDF cites several groups on both sides of the U.S.-Mexico border working together to help protect these wild cats. In additional exploring the cats themselves, we have the opportunity to learn about organizations that are working to promote and protect feline species. Most of the large wildlife conservation organizations, including those listed above (World Conservation Union, National Wildlife Federation, and the Environmental Defense Fund), have projects related to cats. Additionally there are organizations such as the Feline Conservation Federation, which was a valuable source of information about cat species. Although we list both small and large cats, we have been most interested in following small cat species, which receive less public attention than the large and celebrated big cats, like lions and tigers. I came across this rather extensive list of small cat species at the site The Messy Beast. Weekend Cat Blogging #203 is hosted by Salome at Paulchens Food Blog?! The Bad Kitty Cats Festival of Chaos (for us, the “wild cats festival of chaos”) will be hosted by Mr. Tigger and M-Cats Club. The Carnival of the Cats will be up on Sunday at Mind of Mog. Weekend Cat Blogging #98: Endangered Wild Cats on "erf day"
On this Earth Day (or as Luna might say, “erfday”), we turn our attention to the big world outside the window. Climate change is of course the big issue this Earth Day, and we encourage everyone to read the stats about climate change published earlier today. For Weeked Cat Blogging, we present some of the world's most endangered wild cats. The Cat Specialist Group of the World Conservation Union maintains information on the status of the 36 species of wild cat. We only have room for a few of them here. The decline of the lynx population since the 1960s has been primarily caused by habitat loss and a decline of their main prey species, the European rabbit…Nevertheless, there are some areas where habitat quality and rabbit density appear sufficient, yet no lynx are found. Particularly in these areas, it seems that humans are directly responsible for an appreciable level of lynx mortality (Delibes 1989). Certainly, the policy of Fascist-era Spain of paying a bounty for killing lynxes didn't help. As if there weren't already enough resons to despise fascists. In the Andes of South America, we find the gato andino or Andean mountain cat. This odd little cat (look at that tail!) is quite rare, living only the high-altitude rocky and semi-arid sections of the Andes. There is not a lot of information known about it, but the low population and specialized habitat would suggest that it is quite vulnerable to climate change. The U.S. is not without its endangered cats. Perhaps the most endangered is the Florida Panther. Yes, it's not just the name of a hockey team, but a subspecies of cougar that were almost wiped out by development and bounty hunters, and now the few remaining panthers live in southwest Florida, one of the areas of the U.S. most threatened by global warming, tropical storms and rising sea levels. The tiny fraction of ocelot habitat that remains is largely fragmented, leaving most ocelots stranded on the 45,000-acre Laguna Atascosa National Wildlife Refuge and on a handful of private lands, with very little new habitat for the cats to raise future generations. Because the south Texas ocelots are found in such small and isolated groups, they tend to inbreed, making them increasingly vulnerable to extinction. There are numerous groups working to protect wild cats from the many threats they face, climate change, habit loss, hunting, etc. The links throughout this article take you various agencies and private groups. Another is the International Society for Endangered Cats. And throughout the U.S., there are wild cat sanctuaries for displaced and/or abused animals. We are happy to report that felis silvestris domesticus is doing quite well, and you can see many happy examples of this species at Weekend Cat Blogging #98, hosted this week by the three lovely striped kitties at Pet's Garden Blog. 1 Rank of 2006 as hottest year on record in the continental United States. 20% Percent increase of America's carbon dioxide emissions from the burning of fossil fuels since 1990. 15% Percent increase of America's carbon dioxide emissions forecasted by 2020 if we do not cap pollution. 80% Percent decrease in U.S. global warming pollution required by 2050 to prevent the worst consequences of global warming. 78 Number of days by which the US fire season has increased over the past 20 years – tied closely to increased temperatures and earlier snowmelt. 200 million Number of people around the world who could be displaced by more intense droughts, sea level rise and flooding by 2080. 358 Number of U.S. mayors (representing 55 million Americans) who have signed the U.S. Mayors Climate Protection Agreement pledging to meet or beat Kyoto goals in their communities. 0 Number of federal bills passed to cap America's global warming pollution. 0 1 Number of times President Bush has mentioned “climate change” or “global warming” in his previous six State of the Union speeches.